Entomologists from Latvia have named Mantis religiosa as the insect of the year. The European mantid is not historically associated with Latvia. The line demarcating the northern distribution in Europe is south of Latvia. 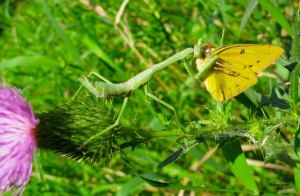 However the European mantid has proved flexible and adaptable in the past, rapidly expanding its distribution area after its introduction to North America.